Sitter: John Campbell Gordon, 1st Marquis of Aberdeen and Temair (1847-1934), when 7th Earl of Aberdeen. 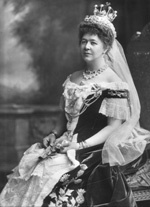 Biog: Lord-Lieutenant of Ireland 1886 & 1905-15; Governor-General of Canada 1893-1898. Descr: FL, standing, with coronet. Orders, Decorations & Medals: Collar and Badge of 'The Most Distinguished Order of St. Michael and St. George', cr. Knight Grand Cross (G.C.M.G. ), 25 May 1895. Neck badges: Grand Master's Badge of 'The Most Illustrious Order of St. Patrick' & badge of 'The Most Illustrious Order of St. Patrick'; Queen Victoria's Jubilee Medal (ribbon partially visible). Biog: Dictionary of National Biography; Burke's Peerage; The Complete Peerage, Alan Sutton, 1987; Who's Who; The Times, 8 March 1934, p 18a. Costume: H. Graham Bennet, "Dress worn by Gentlemen at His Majesty's Court and on occasions of ceremony", London, 1903. Orders, Decorations & Medals: (G.C.M.G.) Burke's Peerage. (Neck badges) Peter Galloway, The Most Illustrious Order of St Patrick, Chichester, 1983. (Queen Victoria's Jubilee Medal) Howard N. Cole, Coronation and Royal Commemorative Medals 1887-1977, London, 1977. 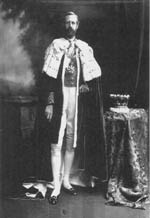 Reproduced: A.C. Fox-Davies, ed., Their Majesties' Court 1906, London, 1907, plate 11.